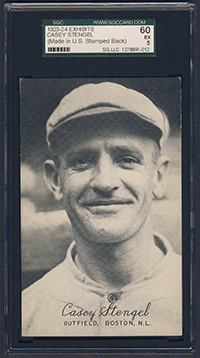 A good outfielder, Stengel's two homers in the 1923 World Series helped the Giants beat the Yankees. As manager of Brooklyn and Boston, he earned a reputation as an entertaining, if not very effective, skipper. His creative use of the language, dubbed "Stengelese," made him a fan favorite. 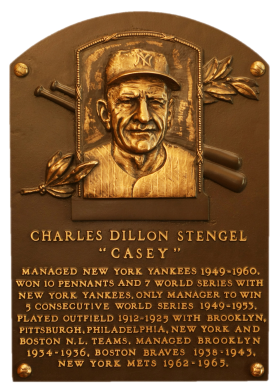 Named Yankee manager in 1949, "The Old Professor" won 10 pennants in 12 years, plus seven world championships. He had a career 1,905-1,842 record. Comments: It had been quite a journey with the "Old Professor" - purchasing a 1962 Topps PSA 8 in February, 2005; a 1950 Bowman PSA 8 in September, 2005; a 1951 Bowman PSA 6 in June, 2006 followed by a 1961 Scoops PSA 8. On January 16, 2011 I was browsing eBay and came across a 1923-4 Exhibits Stengel PSA 3.5. It was completely an impulse buy. I had seen the card before and loved the picture but the price was always very high. It was just a better card when compared next to my 1961 Scoops PSA 9 (won on eBay in April, 2008 to upgrade the PSA 8 mentioned above). I didn't have a single card from this year of Exhibits. Also, it's possible former Angels owner Gene Autry may make the Hall of Fame someday and he has a great 1961 Scoops card. So I pulled the trigger. One of our mutual friends had arranged group tickets for us during the National. It was an interesting experience. Anyway, Brian countered with a reasonable price and we agreed to a deal. I’m the new proud owner of a gorgeous Stengel – the highest graded example to date. 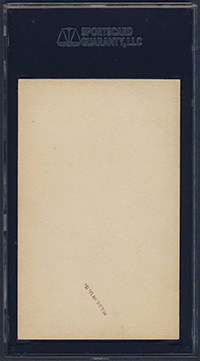 Description: The Exhibit cards for 1923 and 1924 are generally collected as a single 128-card series. 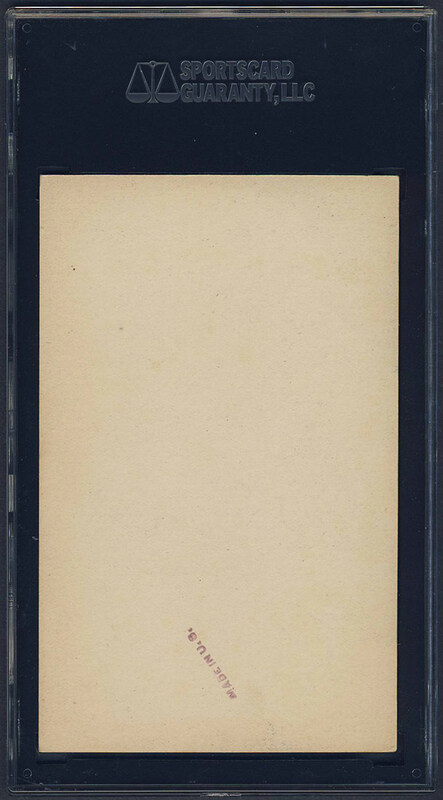 The format remained basically the same as the previous year, 3-3/8" X 5-3/8", with black-and-white photos (some surrounded by a white border) and blank backs. The player's name is again shown in script with the position and team printed below in a small, square block-style. Many of the same photos were used from previous years, although some are cropped differently, and some players have new team designations, background changes, team emblems removed, borders added and taken away, and other minor changes. Fifty-eight new cards are featured, including 38 players pictured for the first time in an Exhibit set.